Fr. Thomas Guerry is from of Savannah, GA, where his family has been in the lumber and building materials industry since the 1920’s. He went to High School and College locally, graduating from Armstrong State College (later Armstrong Atlantic State University, now part of Georgia Southern University), in Savannah, with a BA in History in June of 1989. Growing up, his family were members of the Episcopal Church. Fr. Thomas took an interest in Orthodoxy while in college, and after two years of study and involvement in Orthodox parishes, he was received into the Orthodox Church on November 25, 1989. After college he worked in sales and management in the steel and building materials industries in Savannah until 2005, when he enrolled in seminary the the Holy Cross Greek Orthodox School of Theology in Brookline, MA. Fr. 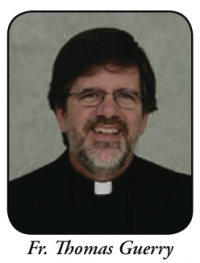 Thomas was ordained a deacon in November 2008, priest in April of 2009, and graduated from the seminary in May of 2009. From June 2009 to July 2013, he served in two churches, as both Assistant Priest at Annunciation Greek Orthodox Church in Winston-Salem, NC, and Serving Priest at St. George Church in High Point, NC. Fr. Thomas began his service as the Pastor of Sts. Markella Demetrios on August 1 of 2013. He married his wife Kathy in February of 1995. The couple do not have children, but served as foster parents from 2001 to 2006. For recreation, Fr. Thomas loves outdoor activities such as golf and fishing, he is also an avid reader and loves music. Saints Markella and Demetrios Greek Orthodox Church originated with a promise made by Mr. Constantine (Gus) Loizos to his family’s patron saint, St. Markella of Chios. Mr. Loizos suffered from kidney stones, and took a pilgrimage to the island of Chios in the 1960’s to pray for healing and ask for the intercession of St. Markella. Mr. Loizos vowed to build a church in her honor if he would be healed. After his pilgrimage, his kidney ailment vanished, but soon after his healing, Constantine choked on a peanut, which fatally caused a blood vessel to burst. In order to carry out his promise to St. Markella, Mr. Loizos’s widow Maritsa Loizos, his mother Irene, and his children began building a local chapel with the help of a local Orthodox layman, Mr. James Middleton. Mr. Loizos had insisted that St. Demetrios also be in the chapel’s name, since St. Demetrios was James Middleton’s patron Saint, and since Mr. Middleton had joined him in prayer for his healing. The chapel was originally intended as a wayside haven on Highway 98 for travelers to pause for prayer. It was completed in 1964, but failed to have the 50 families needed in order to receive its Charter from the Greek Orthodox Archdiocese of North and South America. The chapel also lacked a priest. Under these circumstances, the chapel became a mission of Annunciation Greek Orthodox Church in Pensacola, FL. in 1968. Saints Markella and Demetrios remained as a mission church until the mid-1970’s, growing over time. On October 21, 1975 the chapel received its Charter from the Archdiocese. The first full time priest was Father George Konstantopoulos. In 1975, a parish hall was built adjacent to the Church. In 1980, James J. Tringas donated adjacent land to the Church for use in future construction. A building fund was established in 1992 by a donation of $200,000 worth of stock from James Tringas. Plans for a new Church building began at the same time while the parish patiently waited for the building fund to grow. The Church hired renowned Orthodox architect Christ Kamanges to design the new Church building. In early 2003 the value of the stock comprising the building fund had risen to a point where preliminary work for the new Church could begin. The Church had its parking lot paved and the entire premises landscaped. Later in the year, the Church building committee arranged financing for the construction of the Church itself. The decision to move forward in this construction was put to a vote in a parish general assembly, and the move to begin construction was made by a majority vote. The Church broke ground on July 26, 2003, and construction began on August 26, 2004 when the foundations were laid down. After a long and trying construction period, we moved into our new Church building on October 13th, 2007, marking a new phase in the history of Saints Markella and Demetrios Greek Orthodox Church.